All Things Katy! : A Very Merry My Little Ponies Christmas 2013! I woke up around 6:30 AM, got showered and dressed, went downstairs, made myself some coffee, sliced up some lemon bread, turned on the Christmas tree lights, the fireplace and some holiday music, took some pictures and checked my email- all before Katy woke up about an hour later. Then, when she finally woke up, all she wanted to do was snuggle, so I was okay with that. After stalling long enough, though, Katy went in to wake Nanny and Poppy Jones. Then the real fun began! We all went downstairs and Katy- being the only child present- was followed by a paparazzi of flashes while she opened gift after gift for the next couple of hours. Her bike from Santa was out in plain sight and it was the first thing she saw. Her wide-mouthed, excited reaction was priceless and I believe it's safe to assume that she liked her bike with baby seat (want) and helmet (need) from the jolly man in red. Katy was the recipient of many wonderful gifts that she enjoyed. A remote control dog from Aunt Megan and Uncle Jason, a baby doll with accessories from Gaga Jones, MLP purse, activity book from Uncle Rob and Aunt Julie, a herd of ponies and many other gifts from Nanny and Poppy Jones and a Highlights magazine subscription, MLP book and game from Grandma and Pop-Pop Tinkey. (Katy received as set of dolls/clothes from Aunt Hope and Uncle Eric and Crayons/coloring set from Uncle Josh and Aunt Delinda, earlier in the season). After we finished opening presents, Ted cooked up a festive brunch of Christmas-shaped pancakes (a reindeer for Katy, a stocking for Nanny and Santa for Poppy). After brunch, Lil' Miss had to taker her new bike out for a spin- never mind that it was 33 degrees outside!! 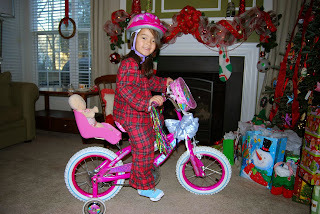 She didn't seem to mind the chilly temps at all and I have a feeling she'll be riding the bike like a pro, before long! In keeping with the laid-back vibe of the day, we decided to go out and see the movie, Frozen, this afternoon. I was pleasantly surprised by the fact that I enjoyed the movie almost as much as Katy did. Lil' Miss had a good ol' time eating popcorn and M&Ms throughout the movie (no judging, please- it's Christmas, afterall! ;-). We returned home from the movie late afternoon. Katy played a little more with her new toys while the adults made phone calls to relatives. After everybody had spoken to everybody, we ordered Chinese take-out for dinner (no cooking, minimal clean-up- Merry Christmas to me :-). We watched White Christmas while eating dinner. That girl LOVES White Christmas (or, as she calls it, "Bob and Judy," or, "Bob and Betty.")!! Katy was tuckered out by the day's events and didn't put up much of a fight going to bed. The adults ended the evening on a fun note while playing a rousing couple of rounds of Balderdash- love that game!